Yes, this is a very boring builder special door. But for now, it has to do. Unfortunately, I did a very very stupid, very bad thing. I thought since I bought fancy Sherwin Williams paint - Resilience Exterior Satin - that I could just sand well and paint. Yeah, well that was dumb. The parts that were painted tan still looked....tan. Oh, and the paint I got is completely underwhelming. It was runny as hell. Don't buy Resilience! This picture show two more coats. Oh my gosh, this project will never end!! I even started just putting coats of orange on the insets where the tan paint was...it helped a little, but the whole door still needs another coat. For awhile we had a lovely orange and green combo. We had to replace the green door, the glass insert was ugly with a beveled design around the edges, and we didn't have a screen. The door itself was a weird brand I've never seen before, so I couldn't easily buy just a screen. And I didn't want to paint out the green! 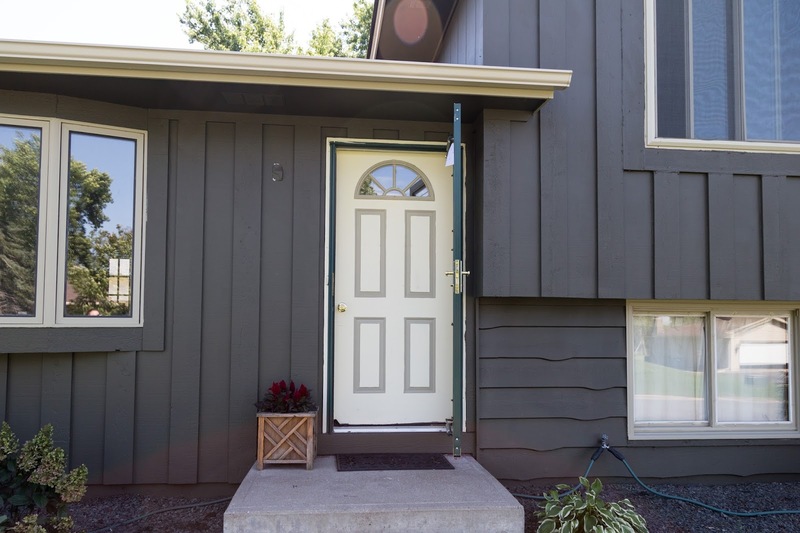 I called a contractor that only installs storm doors and he picked up our new doors (one for front and back), installed them, and hauled away the old ones for $125 each. After we purchased the doors, of course. I thought that was CASH WELL SPENT since it took the guy almost two hours for each door!! Of course now, the stupid new storm door looks PINK. I knew 'sandstone' would be a little more pink, but next to the body color and the trim on the rest of the house, it doesn't please me. I carry my color swatches with me everywhere I go these days, and last trip to Home Desperate I happened to find this spray paint that is almost exactly the same color as our Clarksville Gray trim. 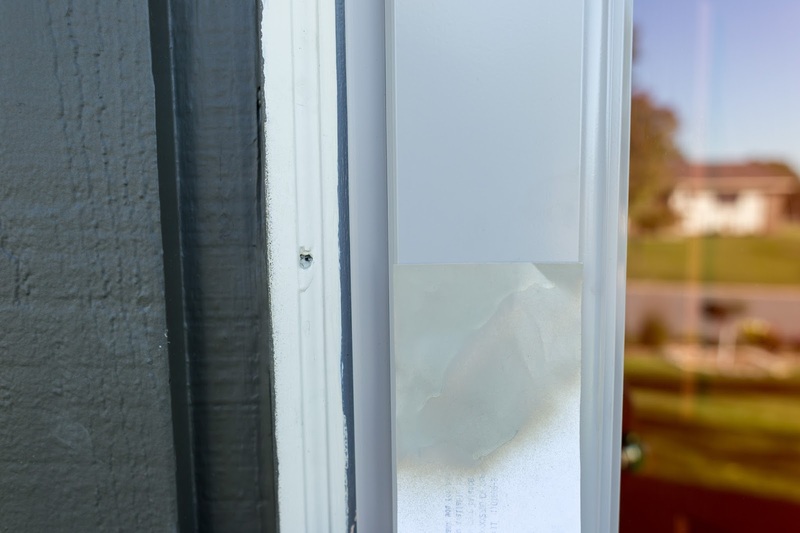 And when I sprayed a piece of paper to see how the color compared to the door, the difference was subtle, but I think it would look a ton better. Now I have to decide whether I should waste time spraying my brand new storm doors, or just live with it. The farther away you are, the harder to see the pinky beige door. What do you think? Is our door too loud? We have had a couple neighbors tell us they like it, but I think most of them are still a little shocked. I think once we get our lights and house numbers up, it will look more finished. 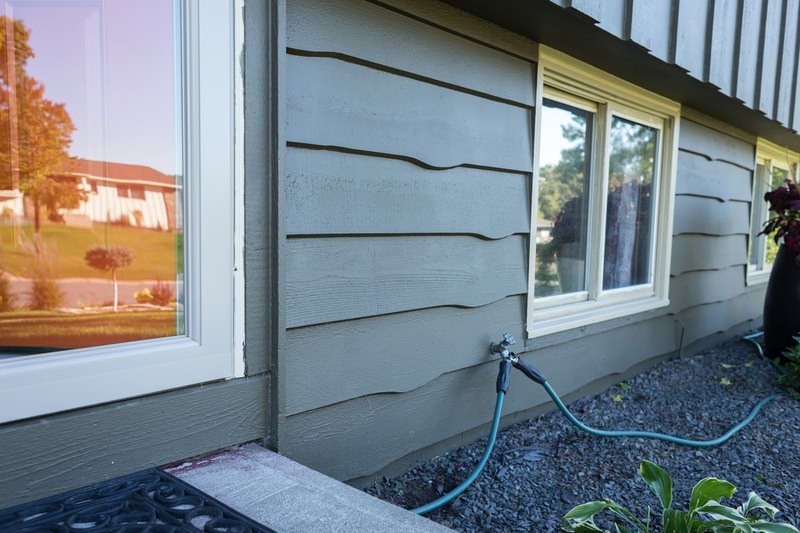 Still do to: a ton of trim paint, garage door paint, and addressing those lower windows. I love the dark gray that you chose for the main color. The orange IS bright but looks good. It isn't ho hum that is for sure! Everyday I cut through the nicest part of Dallas to come home from work and go by a house with the same color combo and just love it. I think the orange looks great. 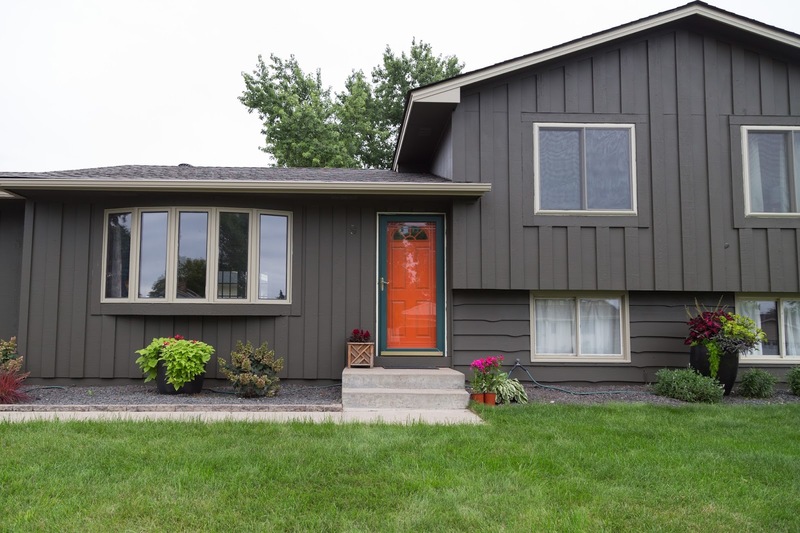 Trust me, painted front doors fad with sun...it's good that you went bold. As for the storm door I don't see the pink. Live with it a while and see what you think! 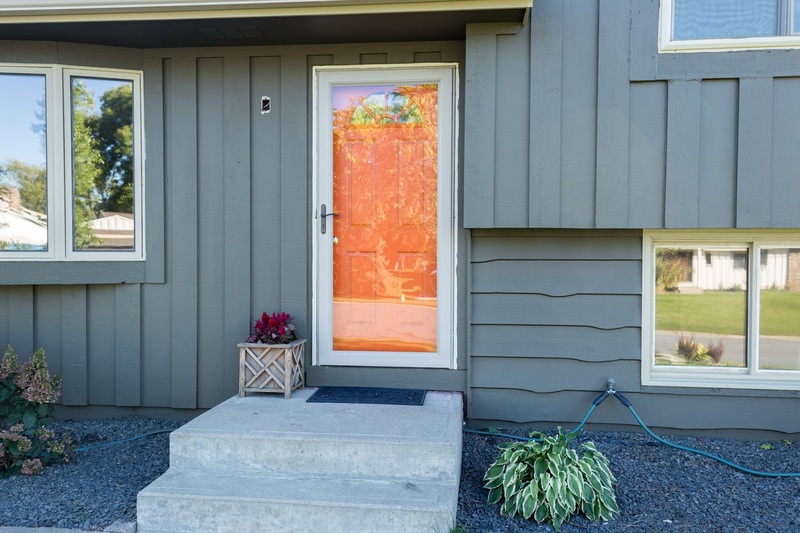 i don't think the storm door looks pink, and i like the orange front door color with the house color. it is bright! what color are you painting the garage door? oh yes! that is so perfect! The storm door will probably fade, so I'd wait. I think it bothers you more than anyone else! I love it. It's a nice pop of color and you can't tell at least in the pics that the door is off. It all looks lovely! HA, it does look like Home Depot! I think the white balance of my photo is off, too..in real life it is slightly more red. 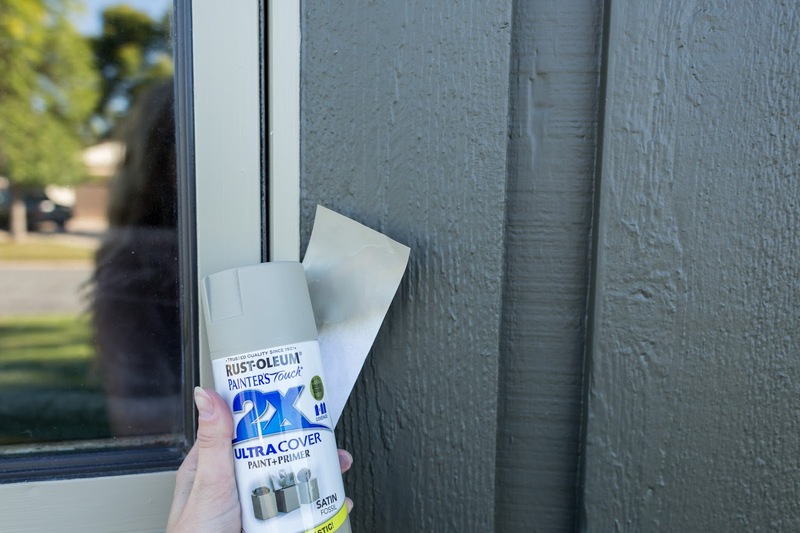 I also know that in the summer when we put our screen on the storm door, it will be much darker....so there is that. Keep the opinions coming, I don't mind! Janelle - yes, we are going to plant some flowers. It's a little tricky because I do not want to cover the lower family room windows with anything, so I'm still figuring it out. Also, you donated 24 inches of hair?! WOWEE! Good for you! Katie, the garage door will be the trim color. I'm just too lazy to do it! I love it! Of course, I have a dark brown house with grey and white trim and a Bright! Green! door. My neighbors also complimented me when I did it. Since then, a two-unit condo has switched to bright red doors, inspired by mine. So I'm sure your neighbors do love it and maybe will even follow suit! I'm leaning towards you painting the storm door grey or even orange!! I kind of feel either color will help the screen door, recede into the background, hope that makes sense! 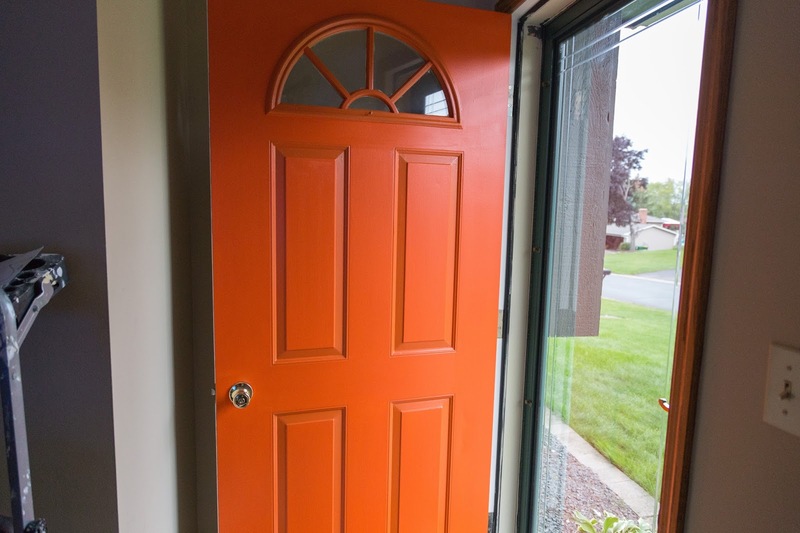 I really want to put a screen door on our laundry / mudroom door that leads to our backyard and if I do, totally paining it to match our Chartreuse door. I love it. And it still looks orange to me. Thanks for the paint tip... I want to paint our front door yellow. Not sure what shade yet but the house has very faded pale blue siding, and we want to paint the maroon shutters gray (like your home is) and then paint the front door yellow. I think this home is looking awesome girl! I love the orange. 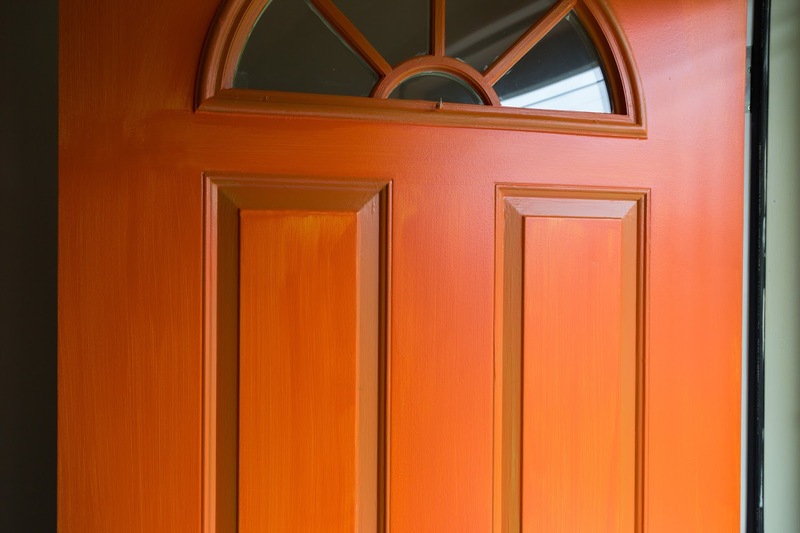 Our front door is an orange stain that has some brown in it, so it doesn't pop like yours. 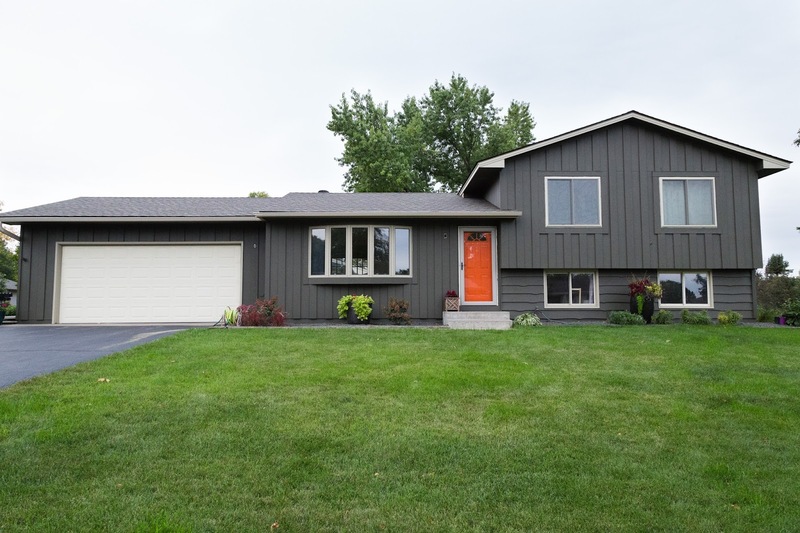 I really love the house color and you get major points for painting the garage doors. I wish ours were a brighter white (probably would be harder to keep nice and clean. You are doing such a great job making this house your home. Keep posting.